This week TOMS announced its annual One Day Without Shoes campaign, asking consumers to go barefoot to raise awareness for what it's like to live without shoes. The brand is encouraging participants to share their shoeless experiences by posting photos of their bare feet on Instagram using the hashtag #withoutshoes. But this year's campaign will do more than just raise awareness. 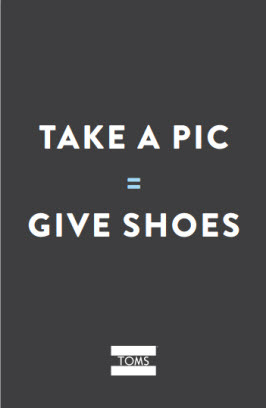 For every barefoot photo uploaded using the hashtag between May 5 and May 21, TOMS will donate a new pair of shoes to a child in need (up to one million pairs). To read more on Cone's Prove Your Purpose blog, click here.